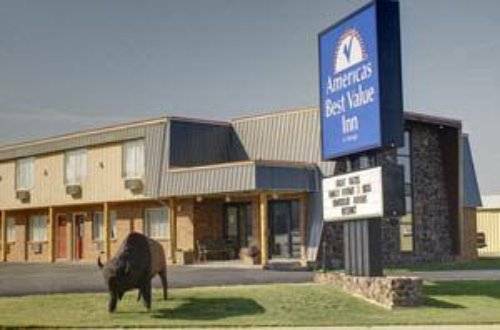 Welcome to Americas Best Value Inn Wall- conveniently accessible from I-90 at Exit 109 or 110. Our small town of Wall- South Dakota- is most famous for the Wall Drug Store. Only half a mile away- the Wall Drug Store opened as a small pharmacy during the Depression- but eventually developed into a large roadside tourist attraction. Our exterior corridor hotel is also 21 miles from Minuteman Missile National Historic Site- 29 miles from Badlands National Park- 47 miles from Black Hills- and 79 miles from Mount Rushmore. Local restaurants include Fat Boys BBQ- Roadtrip Cafe- Red Rock Restaurant- and the Cactus Cafe and Lounge. Americas Best Value Inn Wall offers comfortable accommodations- affordable rates- and a friendly 24-hour front desk staff to help you feel at home. Start your day right with our free hot deluxe continental breakfast. Relax by our seasonal outdoor pool. Appreciate the convenience of our guest laundry facility. Stay connected with free wireless high-speed Internet access available in our common areas and guest rooms. Step into the privacy of your own guest room with amenities including a microwave- mini-fridge- coffeemaker- hairdryer- cable TV- clock radio- desk with lamp- free local calls- and wake-up service. At Americas Best Value Inn Wall- We*ve Got You Covered from the time you hit the road- until the time your head hits the pillow. Americas Best Value Inn Wall is conveniently located with easy access off I-90 at Exits 109 or 110. We are just 7 miles from the Badlands. Our address is 201 South Boulevard/ Wall/ SD 57790.